AP -- Trail Blazers center Jusuf Nurkić recorded the first triple-double of his career and the first by a Trail Blazer since 2014 as Portland defeated the Cleveland Cavaliers 129-112 in front of a crowd of 19,089 Wednesday night at the Moda Center. The Trail Blazers are now 27-19 overall and 19-7 at home this season. They have now won five straight at the Moda Center, six straight versus the Cavaliers at home and six straight versus teams from the Eastern Conference. Portland is now 13-3 against teams from the Eastern Conference. Portland finished with 16 three-pointers, led by Lillard with four. Lillard opened the game with back-to-back 3-pointers and the Blazers had six threes in the opening quarter to lead 30-26. "I think it was bothering him," said Stotts of Lillard's hand. "I kind of teased him after his first two shots, you know, how’s your hand? It was bothering him. On that very next play, he was guarding the post and swiped down on the ball but he made sure he swiped with his left hand, so his hand is still sore." Portland finished the first half with 11 three-pointers, while the Cavaliers had just two. Portland led 62-55 at the break. Portland stretched the lead to 70-59 on Jake Layman's 15-foot jumper in the third quarter. Lillard's three-pointer made it 82-66 midway through the third and Portland went on to lead by as many as 21. Jusuf Nurkic recorded his first career triple-double, finishing with 10 points (3-6 FG, 4-4 FT), 10 rebounds, 10 assists and five blocks. He is the first Trail Blazers player to record a triple-double since Nicolas Batum did so on Jan. 8, 2014. Nurkic is the 16th player in league history to record a triple-double with points, rebounds and assists while also blocking at least five shots. He is the first player to accomplish the feat this season. Damian Lillard scored a game-high 33 points (11-19 FG, 4-6 3-PT, 7-7 FT) to go with two rebounds and six assists. It was the second game in a row and the 15th time this season that Lillard has scored 30-plus points. 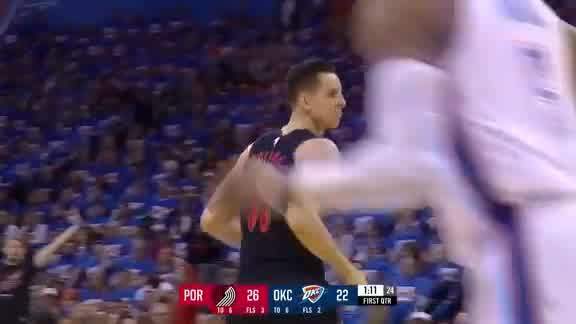 With his third field goal, Lillard (3,990 field goals) passed Jerome Kersey (3,981 field goals) for fifth place on the all-time franchise field goals list. CJ McCollum had 19 points (7-13 FG, 2-4 3-PT, 3-4 FT), three rebounds and one assist. It was the seventh time in the last eight games that McCollum made at least two three-pointers. Jake Layman scored 18 points (8-11 FG, 2-2 3-PT) to go with three rebounds and three assists. It was his third straight game scoring in double figures, marking the longest streak of his career. Al-Farouq Aminu logged 14 points (6-7 FG, 2-3 3-PT), nine rebounds and one assist. 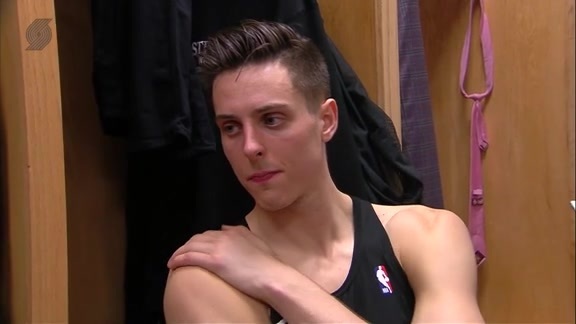 Zach Collins finished with 11 points on 3-of-8 shooting (3-4 3-PT, 2-2 FT) to go with one rebound before fouling out in 17 minutes. His three three-pointers mark a career high (two, 13 times). Evan Turner contributed seven points (3-6 FG, 1-4 FT), four rebounds and four assists off the bench. Jordan Clarkson led the Cavaliers with 22 points (9-17 FG, 2-4 3-PT, 2-2 FT) off the bench to go with three assists. • The Trail Blazers won their fifth straight game at Moda Center, marking their longest winning streak at home this season. • The Trail Blazers defeated the Cavaliers at Moda Center for the sixth consecutive meeting. 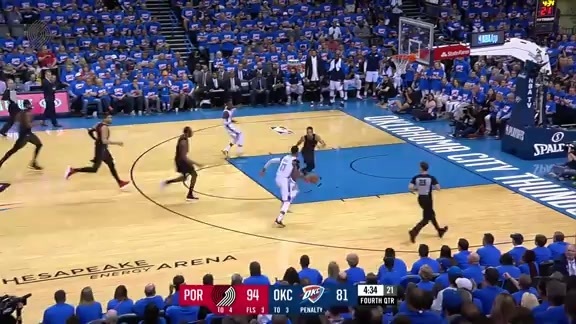 • Portland shot a season-high 55.2% from the three-point line, connecting on 16 of their 29 at-tempts. The Cavaliers shot 31.6% from deep (6-of-19). • The Trail Blazers committed a season-low four turnovers while the Cavaliers had just three turnovers. The seven total turnovers are the fewest turnovers for both teams combined in a game since turnovers were first officially compiled in the 1970-71 season (10, LA Clippers at San Antonio Spurs, Dec. 13, 2005). • Portland’s 129 points tied for the third-most they have scored in a game this season. • The Trail Blazers had 28 assists while the Cavaliers dished out 17 assists. After hosting Eastern Conference teams in four straight games at home, the Trail Blazers get back to a more familiar foe when they host the New Orleans Pelicans Friday night at the Moda Center. Tipoff is scheduled for 7:30 p.m.